Preparing For Our Children's Future: Princess Summer Party Menu and Recipes!!! Princess Summer Party Menu and Recipes!!! For Princess S. Birthday, she ask for a horse cake, so I thought I would try to come up with a menu that would maybe fit a theme and be kid-friendly, finger foods! well blended. 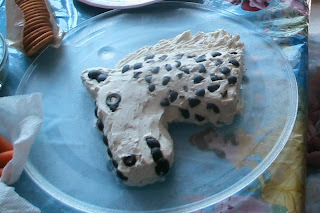 Shape into horse head using a butter knife and fork. Decorate with black olives. Cover and refrigerate for at least 2 hours. Serve with crackers. Yield: about 3 cups. I had a jar of pizza sauce, mozzarella cheese and we had just bought, cooked sliced and put a ham in the freezer! Every recipe I found called for crescent dough! 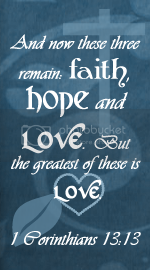 Well I did not have that and do not buy it, so I decided to find a dough recipe! Let stand for 5 mins. Knead 7 minutes. Let rise one hour. Divide in half. Roll out into 2 round 18" circles. Use pizza cutter or butter knife to cut into pie wedges each. Roll up a hotdog into each wedge. Let rise 1 hour. Bake at 350 for 15-20 minutes." For a step-by-step on how to make them, please visit "Seagull Fountain"! Now for what I did! Yes, I went a little wild and had so much Fun! I made a triple batch of the dough! Warning use a Huge bowl if you do this! lol! When the dough was ready to fill I filled one batch (divided in 2 halfs) with summer sausages (like hotdogs) and velvetta cheese. I cut the dough in the wedges and rolled into crescents. That made 16 pigs in a blanket! The second batch, I rolled out (divided in 2 halves)into more of a square shape and cut into 8 rectangles. I put some pizza sauce, sliced mozzarella cheese and chopped, sliced ham. Then I folded the dough over and pinched down the edges to form pocket pizzas! That made 16 Pizza pockets! The last batch, I rolled out into (divided in 2 halves), two 18 in. circles, then I spread a thin layer of pizza sauce (optional), sprinkled with mozzarella cheese and frozen spinach (thawed and drained). Then I rolled it like you would a log for cinnamon rolls and cut into slices! 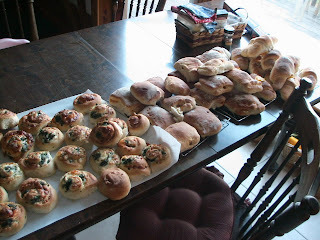 That made over 20 spinach rolls! All of the rolls turned out soooo good! I was very happy! 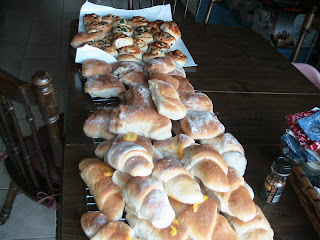 Here is another picture of all of the rolls! 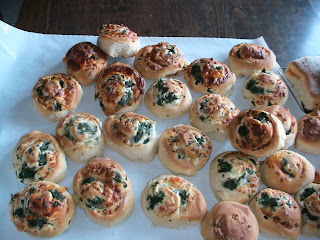 A close up of the spinach rolls! Yum! 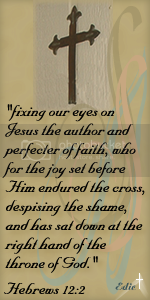 And last but not least, I wanted some bars! I thought oat bars would be a hit and I found a recipe that I changed up and it turned out SOOOO YUMMY! Sorry I do not have a picture of mine to share! Maybe next time! •In a large bowl, cream butter and brown sugar until light and fluffy. blended. Set aside 1-1/2 cups for topping. pan. Bake at 350° for 10-12 minutes or until lightly browned. over crust. Sprinkle with reserved crumb mixture. •Bake for 20-25 minutes or until lightly browned. Cool on a wire rack. Refrigerate leftovers. Yield: about 3 dozen. Hasbro Gator Golf Game Review! 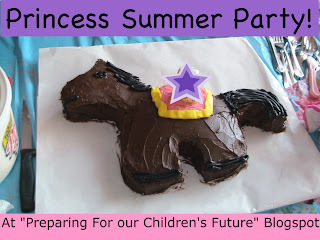 Princess Summer Party Is On At My Blog!!!!! Old Sewing Patterns! How Exciting!!! Find It Games Giveaway Winner! CSN Stores giveaway At "Taking Time For Mommy"
Hurry to Enter My "Find It Games" giveaway!! !